When the congressional teabaggers orchestrated the government shutdown (and threatened to make the government default on its loans by refusing to raise the debt ceiling), the business community (who had faithfully pumped huge sums of money into GOP coffers for the last few elections) came to a soul-shattering realization -- that the teabaggers did not have the same goals, and were quite willing to trash the economy if they couldn't win legislative or electoral victories. This was unacceptable to the business community. While they hold right-wing ideas about government, they need a thriving economy to provide consumers for their goods/services -- and they decided the party must return to a more moderate conservatism. This has set up an impending war -- a war between the business-oriented establishment Republicans and the ultra-right-wing teabagger/fundamentalist Republicans. The first skirmish of this internal party war took place last Tuesday -- in Alabama's 1st Congressional District. That district held a special election primary on election day, to fill the U.S. House seat vacated by the resignation of Jo Bonner (who had resigned after six terms). The first GOP candidate to file for the office was former State Senator Bradley Byrne. But Mr. Byrne didn't satisfy the district's teabaggers. They considered him too moderate, and went in search of a truly looney ultra-right-wing candidate -- and they found one in Dean Young (a real estate developer who labeled himself a "Ted Cruz congressman"). The business community poured funds into the Byrne campaign, but this is strong teabagger territory -- and it was anybody's guess as to who would win the race. On Tuesday night, the establishment Republican eked out a win. Byrne got 38,150 (52.5%) votes and Young got 34,534 (47.5%). 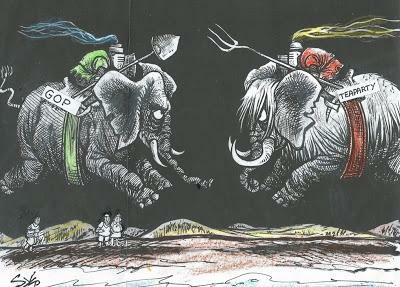 The teabaggers had lost the first skirmish in the GOP's internal war. This does not mean the GOP will be immediately returning to a state of sanity anytime soon though. This is going to be a long fight -- and will be fought out in the party's primary's in 2014 and 2016 (and maybe even longer). I think the establishment business-oriented branch of the party will eventually win, but it won't be easy. Now that the teabagger/fundamentalists have had a taste of party power, they won't give it up willingly.